Fin-Fisher Charter Services was formed in 2015 by USCG approved Captain Shane Britt. Fin-Fisher Charter Services was named after Captain Shane’s two son’s Finlynn (Fin) and Fisher. Capt. Shane is fully licensed and insured and certified in CPR and first aid. Capt. Shane comes from a long line of commercial fishermen in his family, being one himself since 2012. He spent most of his childhood on the water learning to navigate the backwaters of local Brunswick County waters. He has been a true pleasure angler and tournament angler since he was in his early teens. He has competed and placed in many tournaments ranging from inshore flounder tournaments to offshore king mackerel tournaments. Capt. 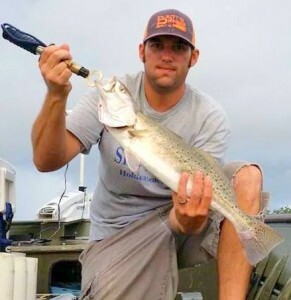 Shane is best known for his hand made Bucktail fishing lures that he has been making since 2013. You can find Britts Bucktails in many of the local shops here on the coast and are favored by many of the local anglers. In 2014 he decided with his knowledge and passion it was time to make the move from commercial fisherman to charter boat Capt. He loves being on the water and teaching people the art of catching fish. Book today and let his passion for fishing turn into your obsession.